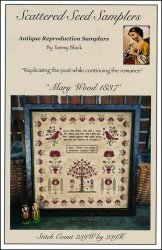 Mary Wood 1837 [G1036] - $16.00 : Yarn Tree, Your wholesale source for cross stitch supplies. Cross stitch pattern by Scattered Seed Samplers. Adam & Eve stand below the apple tree. A couple of different varieties of flowers as well as two birds, are stitched beside the apple tree. Above the apple tree, a saying is stitched. A floral pattern is stitched around the edge of the design to complete it. This is "Mary Wood 1837." Stitch count 239W x 239H.